You might have heard a lot about wireless networking, wireless access points and wireless computing, but what is wireless technology really all about? Wireless technology uses radio waves to transmit information without cables or wiring. Although wireless communications have been used since 1876, the technology is now being widely used to create wireless computer networks. There are many standards for wireless communications, including Bluetooth, DECT and WiMax. WiFi or 802.11 is a set of standards designed for wireless ethernet LANs (local area networks) and is the protocol used by all of our miniPCI wireless cards. See below for a comparison of the common wireless standards. Why would I want to use wireless technology? Using a wireless network means that you can move about freely, within your home, business or even your city, and still maintain a connection to other computers on the same network. Installing cabling can be expensive, especially over long distances, in difficult terrain, or in established buildings, so it can save you a considerable amount to use a wireless network instead, provided the environment is suitable. For WANs (wide area networks), using wireless technology also means you don’t have to pay for access to existing telecommunications infrastructure. What do I need to use wireless technology? To make use of a wireless network, you’ll need wireless-capable computers and devices such as wireless access points or wireless routers. You can build your own access point or router using dedicated hardware, like the ALIX and net servers that we sell, or you can buy an off-the-shelf product. Wireless expansion cards (also called wireless adapters) handle the processing of the data that is transmitted or received over a wireless network. Each card supports one or more of the 802.11 standards, and has different characteristics with regard to the chipset used, maximum output power, speed, receive sensitivity, etc. Wireless adapters are available in a variety of formats, including miniPCI and PCI, PCMCIA (CardBus) and USB. All of our wireless cards are miniPCI type 3A or 3B. As with other radio devices, wireless computers can use antennas to improve reception and transmission quality. 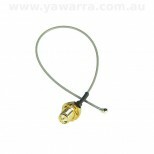 Each antenna has a distinctive pattern of radiation, with omni-directional (360°) being the most common. Antennas can also be directional or sectorised, with transmission and reception occurring in a narrower, more specific direction. The gain of an antenna in combination with the output power of the wireless card, determine the output power (EIRP) of a wireless device. A pigtail is used to connect a wireless card to an antenna. Some pigtails connect directly from the wireless card to the antenna, while others connect from another pigtail to the antenna, allowing for more distant placement of the antenna from the wireless card. With these longer pigtails, loss of signal can occur, so using special low-loss cable (LLC or LMR) is recommended. It’s important to make sure you have compatible connectors on your card, pigtail and antenna. The wireless card connectors are usually u.fl (or I-PEX), MMCX or MCX. The antenna connectors are generally of type N, SMA or TNC. Connectors can also be male or female (you need a matching pair) and straight or reverse polarity (you need the same polarity). All of our wireless cards have u.fl compatible connectors and our pigtails and antennas are either N-type or reverse SMA. Lastly, you need software to run all of this wireless hardware. You’ll need drivers for your wireless card and a network-capable operating system. You can find links to drivers for our wireless cards and various operating systems on our useful software page. The low-powered radio waves used by the 802.11 protocols are generally regulated under a class licence, which means anyone is allowed to use them. However, there are legal limits to the power you are allowed to output from a wireless device in these spectrums. 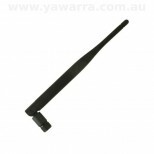 In Australia, the limit is 4W (36 dBm) for 2.4 GHz and 4W (36 dBm) for 5.8 GHz. To use other frequencies or output power above these limits requires a licence from the Australian Communications and Media Authority (ACMA). For more details, you’ll need to read the current class licence from the ACMA for radiocommunications. You might also find this dBm to Watt conversion table useful. When choosing the right wireless card for your application, it’s important to realise that power isn’t everything. In fact, in some situations, too much power can be a problem. You also need to take into account factors such as receive sensitivity and the operating frequency ranges. Receive sensitivity is the capability of a wireless card to pick up weak signals, which can be more important than its power output. The lower (or more negative) the value, the more sensitive a card is. For example, at 11MBps the receive sensitivity of the Ubiquiti cards is -92dBm, while the CM9’s is only -88dBm. To help you decide which card is right for your application, check out our comparison of our miniPCI wireless cards. Because you’re broadcasting your signal into the open air, wireless networks are more vulnerable to eavesdropping. Although there are ways of securing your information when sending it wirelessly, it’s something to take into account when deciding whether wireless technology is right for you. Some of the terminology used in wireless networking can be confusing. One common source of confusion is the very similar terms dBi and dBm. dBi is a measure of the gain of an antenna. Gain is the way in which an antenna redistributes and focuses the output power of a wireless card. Although the two are related (gain affects power output) they are not the same thing and should not be used interchangeably. Our glossary contains definitions of these and a number of other related terms. Wireless cards, like all electronic equipment, are sensitive to damage from static discharge, especially the RF switch and the power amplifier. Touch your hands and the bag containing the wireless card to a ground point on the board (for example one of the holes in the corner of the board). This will equalise the potential of the wireless card and board. Insert the radio card into the miniPCI slot on the board. Install the bulkhead end of the pigtail into the case. This will ground the pigtail to the case. Touch the u.fl end of the pigtail to a ground point on the board to discharge any static, then attach the u.fl end to the connector on the wireless card. We also recommend that you use some form of lightning protection when using wireless cards and boards in outdoor locations. The table below summarises the features of the 802.11a, 802.11b, 802.11g and 802.11n standards, which are most commonly used in wireless networking. Advantages Spectrum less crowded so less interference. Large range of hardware and software available. Large range of hardware and software available. Faster than other standards because it combines them. Disadvantages Less hardware and software available, especially antennas. Need line-of-sight. Very crowded spectrum. Interference possible with other wireless devices, microwaves, Bluetooth, cordless phones. Very crowded spectrum. Interference possible with other wireless devices, microwaves, Bluetooth, cordless phones and older 802.11b networks. Less open-source support. Not for long distances. Interference possible with other wireless devices, microwaves, Bluetooth, cordless phones. this information can help me for my upcoming ppt. thnks a lott!!! Sweet, simple and to the point.